Tickets will be available to the public. The on-sale date and prices will be announced this fall. 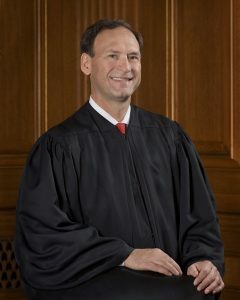 Samuel Anthony Alito, Jr., Associate Justice of the United States Supreme Court, was born in Trenton, New Jersey on April 1, 1950, and was educated at Princeton University and Yale Law School. He served as a law clerk for Leonard I. Garth of the United States Court of Appeals for the Third Circuit from 1976–1977. He was Assistant U.S. Attorney, District of New Jersey, 1977–1981; Assistant to the Solicitor General, U.S. Department of Justice, 1981–1985; Deputy Assistant Attorney General, U.S. Department of Justice, 1985–1987; and U.S. Attorney, District of New Jersey, 1987–1990. He was appointed to the United States Court of Appeals for the Third Circuit in 1990. President George W. Bush nominated him as an Associate Justice of the Supreme Court, and he took his seat January 31, 2006. He has served as an adjunct professor at Seton Hall University School of Law and a visiting professor at Duke University School of Law.